"Good judgement comes from experience, experience comes from bad judgement." The SMART Range (Powered by MILO) is an interactive shooting simulator that provides users with a fully immersive training environment. With the enhanced field of view that MILO Range syetms offers, we can increase trainee realism and provide realistic training scenarios. The MILO Range system is interactive from all directions, allowing trainee responses to multiple threats and applications of proper tactics simultaneously. 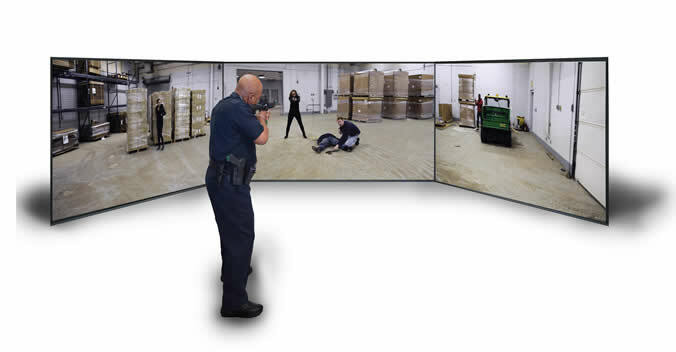 With over 500 interactive scenarios and the capability for SGI training staff to develop additional mission specific content for law enforcement and civilians, ranging from street encounters with violent suspects to reality based scenarios for those who Carry Concealed Weapons (CCW), SGI instructors can create ongoing and verifiable training programs for all shooters.